Just as most of the other home electronic appliances, the iron also requires some maintenance and cleaning. This is especially true for steam irons if you use tap water instead of distilled water when ironing. Tap water has minerals which can cause the accumulation of lime scale and other mineral deposits inside and outside of the iron. #1 Unplug the iron and pour out any water left in it. #2 Make a thick paste from t spoons of baking soda and one spoon of water. #3 Apply the paste on the iron plate with a spatula or another tool. #4 Make sure you cover all areas which have mineral deposits. #5 Let the paste sit for about 10 minutes and then wipe it off with a damp cloth. #6 Use cotton swabs dipped in purified water to clean the steam vents of the iron. #8 Plug it in and turn the iron on to the highest setting. Steam iron some fabrics for several minutes, so that the steam vents are cleaned from any mineral deposits and another residue. You can also try turning it on to the medium high heat level and just let it steam out for 5-10 minutes until the vinegar evaporates. #9 Pour out the water after you have turned off the iron. 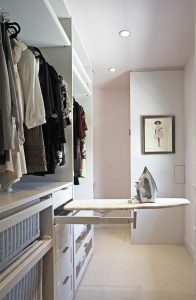 In fact, you should pour out the water after every time you do ironing so that the water doesn’t cause mineral build up. You can clean the iron plate from grime by using a damp cloth and wiping it while the warm is slightly warm. This will help soften and remove any residue stuck on it. If the stains do not want to bulge, you can use a nylon mesh pad and some mild detergent to scrub it. Dryer sheets are good for cleaning the bottom of the iron from accumulated dirt. After cleaning the iron plate, take a clean cloth and iron it for a while to make sure that any remaining dirt gets stuck on it. If you get fabric stuck while ironing, immediately presses on a wet sponge on the area. The temperature difference will cause the fabric to peel off. Don’t use abrasive tools or solutions to clean the surface of your iron’s plate.